Did you know that Habitat does more than build new homes with future homeowners? Central South Carolina Habitat for Humanity is a Neighborhood Revitalization Affiliate and is helping to transform communities block-by-block. Habitat helps with cosmetic and minor home repairs, community clean-up, adding accessibility features, and works with veterans to improve their homes. Habitat does this all through a hand up, not a hand out working relationship. Habitat is dedicated to eliminating substandard housing and to make adequate, affordable shelter a matter of conscience and action. From building from the ground up to renovating existing homes, Habitat partners with families and individuals to help them realize the dream of home-ownership through a zero-interest mortgage. Habitat is starting a new effort to transform entire communities, house by house, block by block. We work with the target community’s residents to help them create community-based goals and to help them realize their community’s renewal. From our Home Preservation program to community meetings to partnering with other organizations, Habitat is working to change the face of communities in the Midlands one partnership at a time. Home preservation helps low-income homeowners impacted by age, disability, and family circumstance, who struggle to maintain the exterior of their homes, are in need of accessibility features, and other repairs. 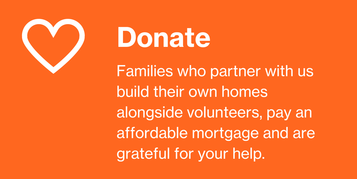 Habitat needs your supports to continually improve our community. Every donation matters. Thank you!